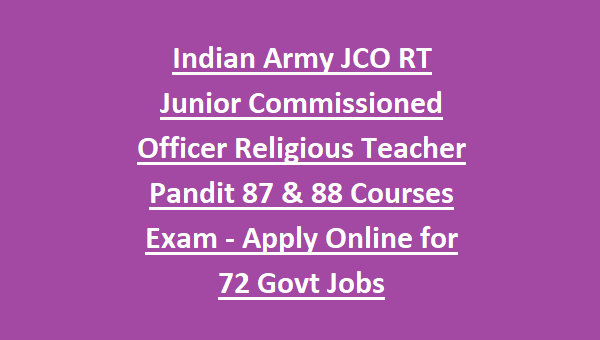 Religious Teachers Junior Commissioned Officers Jobs in Indian Army : Application forms are invited by Indian Army from eligible candidates for the Recruitment to the positions of Religious Teachers as Junior Commissioned Officer (JCO) for RRT 87 & 88 Courses. As per requirement of Indian Army, total available posts are 96. Application mode is online. Online registration process opens from 05-October-2018. Online registration process closes on 03-11-2018. Department will conduct Written test on 24th February, 2019. Candidates must remember that only male candidates are eligible to apply. 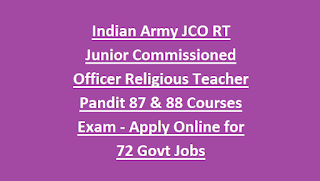 All details of Indian Army JCO RT Junior Commissioned Officer Religious Teacher 87 & 88 Courses Exam Notification Apply Online is mentioned below. As per requirement of Indian Army, total available posts are 96. Category wise Vacancies are mentioned below. Pay scale for Junior Commissioned Officer JCO RT Religious Teacher is Rs.9300/- to Rs.34,800/- per month plus DA, travelling allowances and free accommodation. 1. Online registration process for Junior Commissioned Officers (JCO) Religious Teachers opens from 10th October, 2017. 2. Online registration process for Junior Commissioned Officers (JCO) Religious Teachers closes on 08th November, 2017. 3. Department will conduct Written test on 25th February, 2018. For Civilian candidates age limit must in between 27 years to 34 years as on 01st October, 2019; For serving combatants on remonstration, age limit must in between 25 years to 34 years. Qualification for Religious Teacher Jobs As Junior Commissioned Officer JCO 85 & 86 Courses must be graduation degree in any discipline. Qualification for candidates applying Remustering will be Intermediate/+2. 1. It will be through screening of application forms, Medical test, written test, Physical Standard test followed by personal interview. 2. Written test consists of 2 papers i.e. Paper I and Paper II. Paper I is common for all Religious Denominations. Aspirants must secure 40% of marks in Paper II (Then only eligible for interview round). 3. Paper I is for 100 marks and Paper II is for 100 marks.